Update: See the end of the post with some photos I took at the game yesterday where Beltre got his 3000th career hit – quite a milestone! Those who study and practice Lean often know about Taiichi Ohno, one of the creators of the Toyota Production System, and his famed “Ohno Circle.” As the stories are told, Ohno would draw a chalk circle on the ground in the factory and tell somebody to stand there and observe. Today's post is about standing (or not standing) in a different circle… at a Major League Baseball game. Hat tip to Paul Lukas and Uni-Watch.com (a non-Lean related blog that I read regularly) for an item in this blog post. Late in the stages of the Rangers' 22-10 loss against the Miami Marlins, Beltre was warned by umpire Gerry Davis to get back onto the on-deck circle that he'd strayed from. Beltre, a human adult, responded by dragging the on-deck circle to where he was positioned. Davis, also a human adult, responded to that by ejecting Beltre from the game. Really. Beltre, a human adult, has been in the major leagues since 1998 and is approaching 3,000 career hits, a milestone that usually guarantees induction into the Hall of Fame. For those who don't know baseball, the “on-deck circle” is an area where the next batter up generally stands, stretches, and takes practice swings. This location is usually marked in one way or another. It might remind you of 5S: a place for everything, and every batter in his place? Some batters like to move closer to be more behind home plate instead of to the side… usually the accusation is they are trying to get a better view of the pitcher as they pitch to the previous batter… that's a different form of preparation for their at bat. A photo from Wikpedia… showing a circle sitting on the dirt that surrounds the playing field. In workplaces, the 5S methodology often means marking the correct location for an item, or it marks the home location of where it goes when not in use. This might mean organizing the drawers in a Japanese hospital in a way that makes it easier to find medications in an emergency. Or, it sometimes, sadly, means a bunch of overkill that just upsets people in a “Lean Office” context. In my photo from Globe Life Park, below, I've added arrows pointing to the on-deck circles. “Then the second umpire came down and he told me I need to move. I told Gerry – I have no problem but I don't want to get hit. I've been hit when I stand over there. He said, ‘Well I don't' care. You need to be on top of the mat.' So I pulled the mat where I was at and he threw me out. If the instruction was “You need to be on top of the mat,” then I guess moving the mat is one way to comply with that instruction from the umpire! But, he got ejected for his initiative and creativity. I don't know for a fact that the Rangers had the on-deck circles in that precise location, 37 feet from the center of home plate. But, let's assume they did (that would be a good question for a reporter to ask). The only text reference to a rule about the circle is about moving from there to the batter's box in a timely manner, since baseball is concerned about the length of games, as I blogged about earlier this year. 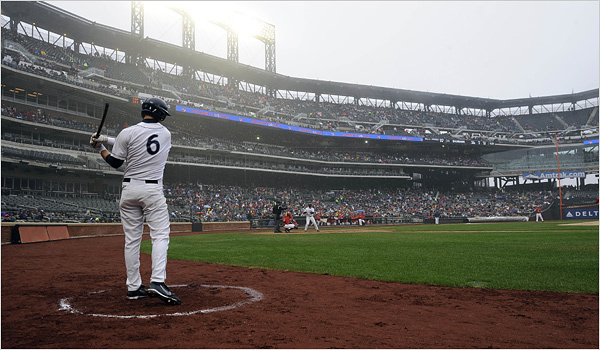 Rule 6.02(d) Comment: Umpires shall encourage the on-deck batter to take a position in the batter's box quickly after the previous batter reaches base or is put out. The rules do state that each umpire can, basically, make rulings on things not covered in the rules, ejecting a player, it seems, whenever they want (other than being questioned about it). Each umpire has authority to rule on any point not specifically covered in these rules. (d) Each umpire has authority to disqualify any player, coach, manager or substitute for objecting to decisions or for unsportsmanlike conduct or language, and to eject such disqualified person from the playing field. If an umpire disqualifies a player while a play is in progress, the disqualification shall not take effect until no further action is possible in that play. Do we see parallels to hospitals or other workplaces? Are there rules that routinely get violated that managers don't notice or don't worry about… until they do? If a rule or standard is important, shouldn't it be enforced all the time? What are your stories about this? Sunday, I had the chance to attend the Rangers' game thanks to a friend who had access to a suite. Sweet! Here is a photo that shows where Beltre was taking his warmup swings compared to the location of the on-deck circle. Beltre was, of course, not confronted by the umpire during this game. Draw a line, like a base coach box or a batters box, showing where they can stand (not that the coaches stay within the lines either, as I blogged about). There's also a safety argument to be made for other players, since the vinyl circles are in play, even being in foul territory. Here are Beltre's career stats. It was great to see history, as he's only the 31st player in MLB history to reach that milestone. And, he might have done that a game earlier had he not been ejected from the earlier game. I should be thanking that umpire, ha ha.